A simple worksheet to get children speaking and using vocabulary they've learned. Questions are formed using have got and can. The following animal vocabulary is used: fish, cows, mice, horses, bats, crocodiles, tigers, snakes, elephants, ants, birds, bears. Procedure: Divide the class into pairs. Student A asks Student B 3 questions about animals. Speaker B answers using the animals listed in the box. 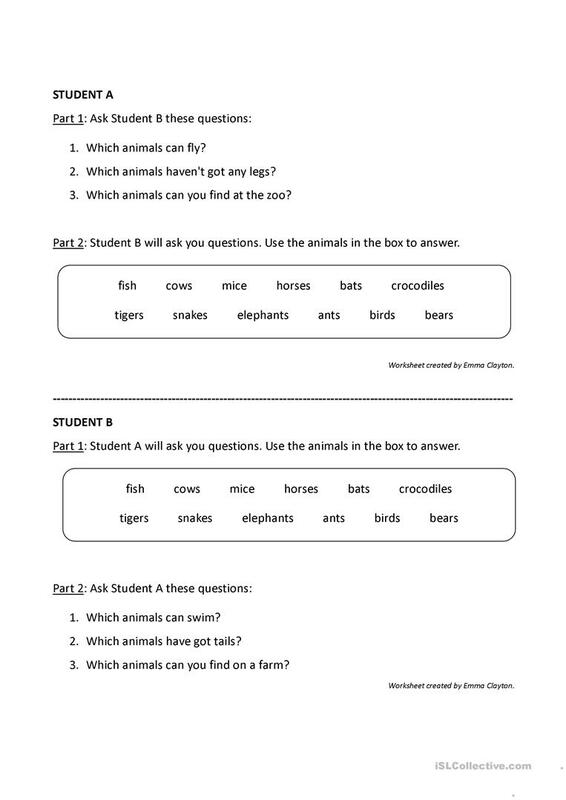 Then Student B asks Student A 3 different questions about animals and Speaker A answers using the animals listed in the box. Both sets of questions are on the worksheet. Can be used as part of a unit or for revision. Would work as a filler as well. Extension activity: the class makes a new list of animals on the board then the teacher divides the class into teams. Each team writes similar questions and then they ask each other. Play for points - the team with the most points wins! The present downloadable handout was created for elementary school students at Elementary (A1) level. It is excellent for working on your pupils' Listening and Speaking skills. It focuses on the theme of Animals.